“Do you plan on waking up tomorrow morning?” Kevin asked me last night, as we were reading in bed. “Um, yes, waking up in the morning would be my plan,” I said. He meant, should he set his alarm or did I plan to wake up early, but the phrasing seemed ominous under the circumstances. My bad news is that it appears my concussion symptoms have not gone away, as I’d hoped, despite a restful week at the cottage. I tested things out last week with three short easy runs that caused me no ill side effects. So I thought it was safe to do a longish run yesterday in preparation for the 25-km trail race, just a few weeks from now: off I went, enjoying a speedy comfortable 13km run in beautiful weather, returned home feeling terrific, and gradually became aware as the afternoon turned to evening that I wasn’t feeling so terrific anymore. Headache, nausea. In fact, I was feeling so off that I realized I couldn’t play in my soccer game. You know me. That’s huge! It was our last game of the season, and we were playing in the cup final. It was painful to stand on the sidelines, but my team played an awesome game under the lights (with a sliver of a moon overhead), and I was so glad I’d come out to cheer. We won! 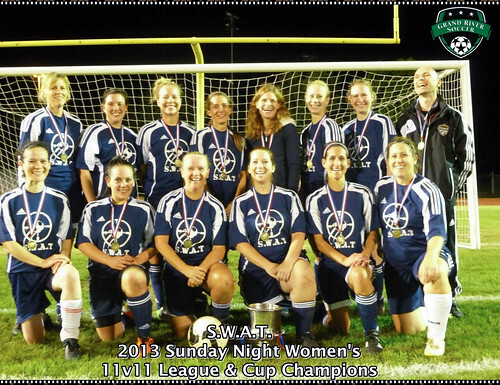 So my team went undefeated all year, won the regular season, and the cup final, and as you can see from the photo, we were all pretty happy. Look, shiny medals! Come to think of it, this is my first experience being on a winning team, mainly because I only recently started playing team sports — this is just my second season. And here’s my observation: it was really fun to win, but it was more fun simply being part of a team that enjoyed playing together (which is probably a good recipe for a winning team). We were well-matched in effort and skill, the talk on and off the field was positive, supportive, and helpful, we put together some awesome plays, and I learned a lot playing with these women. The coach was pretty awesome too. So bottom line: winning is fun, but playing for a happy team is more fun. I feel fuzzy-headed, today, though. Is my writing fuzzy-headed too? I’ve made an appointment with a sports medicine doctor who specializes in concussions. Maybe should have done this weeks ago? But there’s no point beating myself up with should’ves and could’ves. I will keep you posted on progress, and meantime, I’m going to do NOTHING exercise-related. I’m also going for a nap as soon as the guy punching a hole in our basement wall is done (yes, we hired him to do it; something boiler-related). 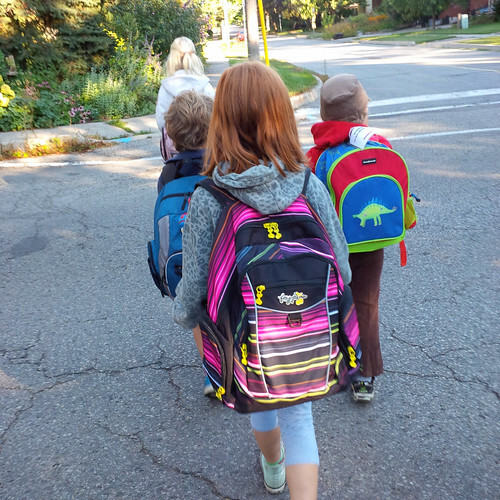 We’re having a nice gradual entry into extra-curriculars this fall. This week Fooey’s gymnastics starts. Piano lessons continue. We have two meet-the-teacher nights, one of which I have to miss due to teaching myself — my class starts this week. I also have a reading on Friday in Toronto, and I encourage and invite you to come: click on the link for details. I’ll be speaking with three other panelists, including the delightful Kerry Clare of Pickle Me This, in support of a new anthology (in which I have an essay) called Have Milk, Will Travel: Adventures in Breastfeeding. These are light-hearted, funny reflections on breastfeeding, and I’m looking forward to sharing stories (and in my case reminiscining, since that time has passed for me, now). So that’s my week. I also have more revisions to get to following an excellent editorial meeting on Friday re Girl Runner. I keep meaning to make an official announcement with links, but I can’t find any links, so I’ll just go ahead and tell you, in my semi-addled state, that if all goes according to plan Girl Runner will be the lead novel on House of Anansi’s list next fall! Gimme a woot-woot! 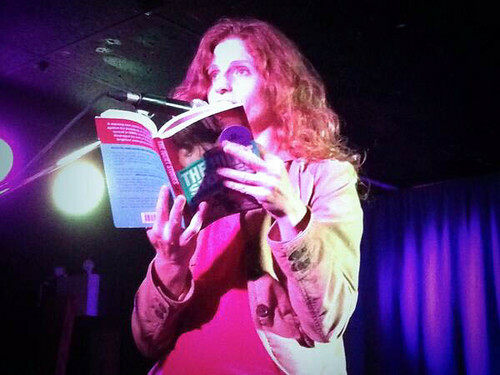 This is a Twitter pic of me reading at the Starlight in Waterloo on Thursday night. Fooey and AppleApple watched with great interest as I applied my “going-out” makeup in the dining-room mirror, with Fooey offering plenty of style advice (AppleApple agreed that Fooey was the expert, and shared her own method for choosing her outfits: “I reach into my drawer in the dark and pull out whatever’s on top.” Then she pairs whatever she finds with soccer shorts). My friend Zoe came along to the reading and promised me that I didn’t look old and haggard. I forgot to ask her about looking “witch-like,” which I think the photo evidence suggests may be the case. In any case, Zoe and I are already excited about planning a launch party for Girl Runner. It’ll be epic! But, oh right, there’s still work to be done before then. And I must rest my head, too. Good morning. Four years post soccer-induced concussion(s) there are still ‘days’ for me. Days of fogginess, dizziness (water slides and sledding are still out), nausea, fatigue. But there are far, far more days of being fine. I think I’ve accepted it as part of me – that I take care not to upset my head, that I do some sports and not others (snowboarding: yes because I’m in control, soccer: no because giant ladies on opposing team’s defense), but because my brain is my most valuable asset, I don’t risk it anymore. I guess I’m saying time, rest, and trusting my own choices have done more for my recovery than doctors. Here’s to your recovery and all the books you’re going to write! Are you able to run, Gillian? I think that would be hardest for me to give up, although giving up soccer would be really hard too. I’m not quite willing to consider that option yet, though I’ve decided not to play winter/indoor this year. We will be home next fall, too, so I am thrilled I will be around for the excitement! We will save the excitement for you, Tricia!! Congrats on Girl Runner, Carrie! Amazing news. Woot Woot! That’s exciting. Can’t wait to read your novel. I’m concerned about your head! Please take care of your brain. I want to see what it comes up with next. Me too, Marita. I’m taking it seriously, I promise! “Girl Runner will be the lead novel on House of Anansi’s list next fall” – Wow! Just wow! What a thing to be able to say … congratulations. I probably shouldn’t even say it! Don’t want to tempt fate. But it is really exciting. Woot woot! So excited to read it.